Extra Long Cushioned Bathtub Mat from Collections Etc. 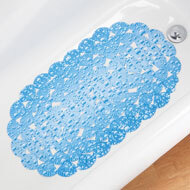 Hundreds of cushiony bubbles on this extra-long mat provide incredible comfort in the tub, while the slip-resistant suction cups on the back provide safety. 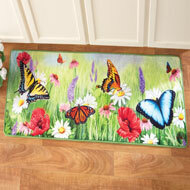 This durable mat won't mold, mildew or fade. Available in almond, blue, clear, lavender, pink , sage green and white. Just rinse to clean and air dry. Vinyl. 39 1/2"L x 15 3/4"W.
Perfect size & color. Just what we wanted. Love!! First one I ever found this long. It fits the entire tub, I love the colors you can get. - Becca, Crivitz, WI. looks nice in my walk-in shower, sticks well to the surface to prevent sliding.  - bbnurse50, Waterbury, Ct.
Will buy this product again. I was very pleased with these mats. Perfect length, I would buy it again! I have searched for a full length bath mat before but never could find one. - Dee, Tracy, Ca. This Extra Long Bath Mat is great. I don't worry about slipping so easily in the tub. I got it to go with all the Cherry Blossom Decor and love it. - liz, Oklahoma City, Ok. EXACTLY AS SHOWN - BEAUTIFUL "WHITE"
Awesome, just what I wanted for safety! I would definatly buy this again. Walks like a dream,, no slipping! I love my bath mat. It is perfect. This is the second one I bought. They are nice and long so no matter where you want to stand in the shower/tub the slippery bottom is covered. Attractive looking. About once a month I flip it over and scrub with baking soda to eliminate any mold buildup. This is for my new walk-in shower where I can also close the dogs in and bathe them and this helps a lot so that their feet are slipping around. - DaneDame, Wellsboro, Pa.
Made my use of my tub much safer! I would buy this bathtub mat again. Usually can't find a mat this large. Size is great but sticking is an issue. Very happy with the mat. BOUGHT THIS ITEM TO USE IN BATHTUB..HAD SUCH AN ODOR WHEN WE GOT IT, HAD TO AIR IT OUT FOR SEVERAL WEEKS NOW...FINALLY GOT THAT SMELL OUT THAT WAS ON IT...WILL PUT IN BATHROOM NOW AND SEE HOW IT WILL FIT AND BE OF GOOD USE... HAVEN'T USED IT FOR A BATH MAT QUITE YET... I AM HOPING IT WILL NOT MOLD OR MILDEW AS IT SAYS..HAVE HAD OTHERS THAT DID.. GOOD PRICE ON SALE, LOVE THE COLOR..MATCHES MY BATHROOM COLORS... IS NICE AND HEAVY AND DURABLE...WE FINALLY GOT IT TO LAY STRAIGHT, SO I THINK IT WILL WORK OUT FINE...LIKE THE EXTRA LENGTH, COULD NOT FIND ANOTHER ONE LIKE THIS ANYWHERE ELSE...GOOD JOBON THIS ITEM // - JUST JODY, HOUSTON, TX. 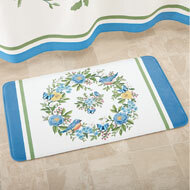 bath mat feels good under your feet. I like the color and length. - Gordy, Cleveland Mo. This product is unsafe as it moves. 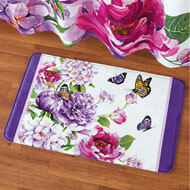 THE DESIGN IS PRETTY AND THAT IS ABOUT THE BEST I CAN SAY FOR THIS SLIPPERY EEL TUB MAT. - NOT HAPPY, LUSBY, MD. It does not work!. It flotes with the shower running. - e., lancaster, pa.
Beautiful blue mat features a beach seashell design and adheres securely to your bathtub with suction cups on the bottom. Textured surface helps improve your footing. Plastic. Measures 27"L x 15 1/2"W.